CHIIR 2018 will be held in New Brunswick, New Jersey. The main conference will be at the Heldrich hotel. The workshops, tutorials, and the doctoral consortium will be hosted at Rutgers University. As a Research 1 University, Rutgers is at the forefront of innovative and collaborative research initiatives. It is also is situated in an ideal location. 38 miles away from New York City, and 65 miles to Philadelphia, New Brunswick provides access to a variety of destinations and attractions in the nearby area. Efficient public transportation also offers flexible travel via air, rail, bus, and road connections to various destinations in the larger metropolitan area. New Brunswick is close to Newark Liberty International Airport (EWR, 30 minutes by public transport), as well as within commuting distance to LaGuardia Airport (LGA) and John F. Kennedy International Airport (JFK), serving the area with both domestic and international direct flights and connections. Presently, New York area airport (EWR, JFK, LGA) offer direct flights to approximately 162 cities both domestically and internationally. Estimates (roundtrip, obtained for March) range based on location: RDU to EWR: $216; Seattle to EWR: $392; London to EWR: $552; and Beijing to EWR: $904. The conference hotel is state-of-the-art meeting facility in downtown New Brunswick. It's 5 minutes walk from the train station and a little over a mile (1.8km) from Rutgers School of Communication and Information. It has 235 luxuriously appointed guestrooms, indoor pool with outdoor terrace, health club, and spa. On the premise is Christopher's Restaurant and Bar, while a number of dining and entertainment options are within walking distance from the hotel. 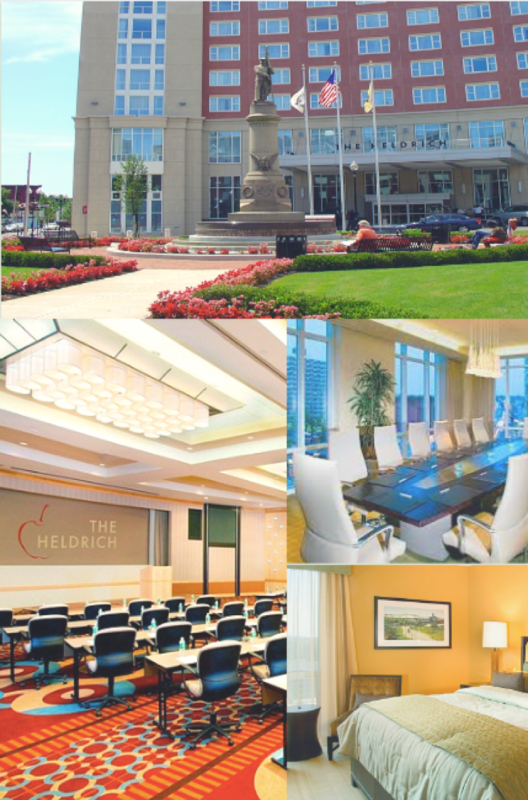 We are pleased to inform you that we have negotiated a special rate of $179/night rate at the conference hotel (The Heldrich). This includes Internet access in your room (a value of $15/day). Please use the following instructions to book your room to avail this deal. But hurry; there are limited rooms with this offer! Book the Hotel. The conference will primarily be held at the Heldrich Hotel and Conference Center. Our opening reception will take place at the Zimmerli Museum on the Rutgers campus. Pre-conference workshops and the doctoral consortium will be held at Huntington House and the School of Communication and Information. The conference hotel is about 5 minutes walking distance from New Brunswick train station. Parking at the Heldrich Hotel is operated by NBPA and is $25/day. It should take around 10 minutes to walk from The Heldrich to Zimmerli. Once you exit the conference hotel, walk on Livingston Ave towards George Street. Take a left once you reach the George Street intersection. When you reach the intersection of George St and Hamilton St, take a left to Hamilton St. Zimmerli Art Museum should be on your left. Alternatively, you can take the Rutgers bus from the Paterson St bus stop (in front of Burger King). If you have taken a left on George St, it should be on your right. Zimmerli is the next stop. From the conference hotel, walk on Livingston Ave towards George St and take a left once you reach the intersection. The Rutgers bus stop will be on your right (in front of the Burger King). Take the EE bus and get down at College Ave Student Center (3 stops). Walk in the opposite direction of the bus for 2-3 minutes, School of Communication and Information will be on your right.